Open daily from 8:30 am until 4:30 pm. Visits to the cathedral are unaffected by weather conditions. We are comparing Saint Paul's Cathedral Skip the Line Ticket Prices from leading ticket suppliers and Try to find you Cheap tickets prices on the market. St Paul’s Cathedral is one of the most important religious structures of the British capital city. The famous cathedral has a striking exterior, with the dome recognizable throughout the world, and the amazing, opulent interior. In the cathedral's crypt, you can see the tombs of some of the most memorable men and women in British history, such as Admiral Horatio Nelson. The structure boasts magnificent mosaics and paintings. When you climb a few hundred steps, fantastic panoramic views of London will delight you. This immense cathedral is the perfect attraction for people curious about history, striking architecture, magnificent views and the first-class art. Your Experience With Saint Paul's Cathedral Skip the Line Ticket? With the entry ticket to the world=famous Saint Paul's Cathedral, you can explore the cathedral's ground floor, crypt and the Golden Gallery at the higher levels. Admire the opulent decoration of one of London's main religious structures and be amazed by an outstanding acoustics of the building. When you descend to the cathedral's crypt, see magnificent tombs of the important historical people buried there, including Admiral Horatio Nelson and Duke of Wellington. When you climb a few hundred steps, panoramic views across London will amaze you. Try to join guided tours of the magnificent cathedral, which are available on a first come first served basis. Examine beautiful paintings and mosaics. 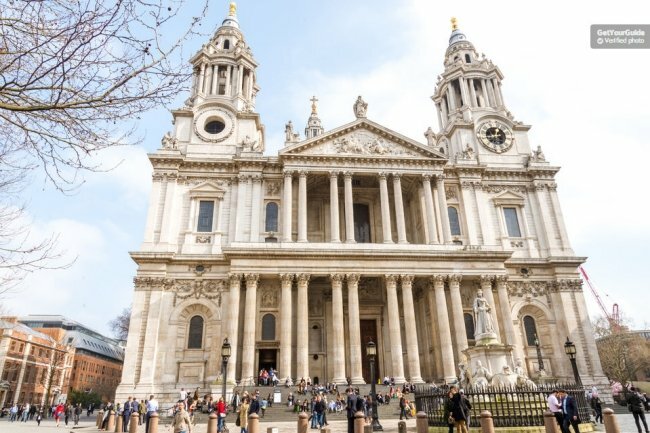 What Saint Paul's Cathedral Skip the Line Ticket Includes? Self-guided tour of St Paul’s Cathedral. Skip the line entry ticket. Informative multilingual audio guide available in several languages, including English, French, Spanish, Russian and Japanese. If you are interested in choral music, visit the Saint Paul's Cathedral on workdays at 5pm. There is usually a performance which lasts around 45 minutes. Travelers Reviews about Saint Paul's Cathedral Skip the Line Ticket? Travelers have a very high opinion about their visit to the St Paul’s Cathedral - 4.7 out of 5 on Get Your Guide, 5 on Viator and 4.5 on TripAdvisor. Visitors to the St Paul's Cathedral were very satisfied with the efficiency of the fast track entry. Also, the usefulness of the audio guide is great for the first-time visitors. Make sure to print your voucher before you arrival to the cathedral. Electronic vouchers are not accepted valid. The listed providers issue full refunds for timely cancellations. Cancellation policies can differ from one provider to another. This ticket for the Cathedral of Saint Paul entitles you to visit everything between the crypt and the top levels that offer great views of the city of London. Taking photos inside the Saint Paul's Cathedral is forbidden. Before coming to the cathedral, check whether the cathedral is fully accessible (certain events may limit the accessibility to some parts of the structure or in full). Children must be accompanied by adults to visit the Cathedral. Address: St. Paul's Churchyard, London.